“Dig. 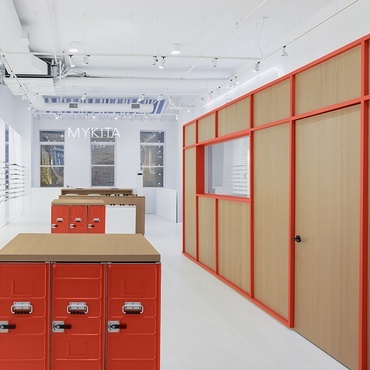 Let’s see what emerges.” Not your standard architectural brief. 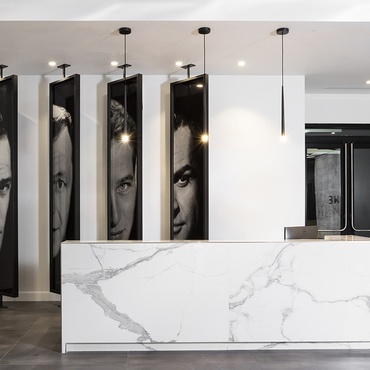 Yet it was with that freedom—equally glorious and nail-biting—that Basalt Architects and Design Group Italia undertook the expansion and reinvention of a wellness destination. It’s at Iceland’s wildly popular Blue Lagoon, which gets more than a million visitors a year. 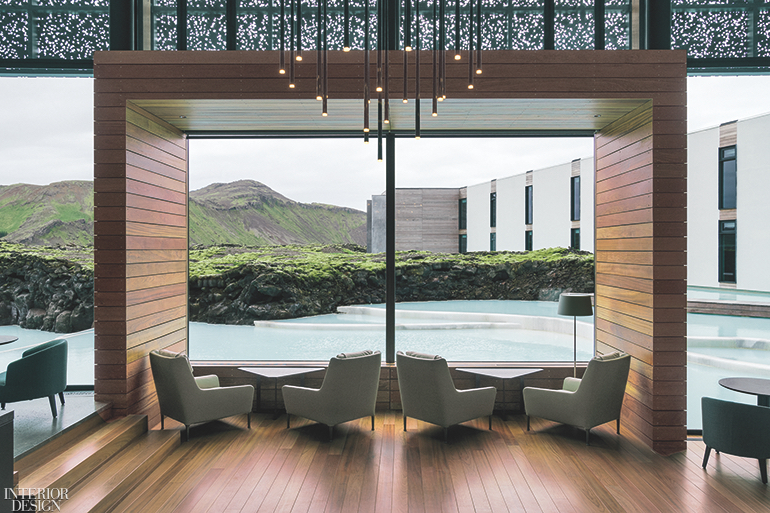 Whereas making the Retreat Hotel and the Retreat Spa far more exclusive experiences, true retreats, was the other directive given to Basalt founding partner Sigríður Sigþórsdóttir and DGI chief creative officer Sigurður Thorsteinsson. A volcanic eruption 800 years ago gave the Blue Lagoon its start by turning part of a peninsula, which extends beyond Reykjavík, into a lava field. In the 1970’s, a geothermal power plant was built on the peninsula, in the town of Grindavík. Engineers for the plant had expected that its runoff would seep back into the ground. Instead, it pooled on the lava rock and silica-heavy soil, forming a reservoir of striking beauty. Locals soon starting plunging into the warm aquamarine water, as yet unnamed. 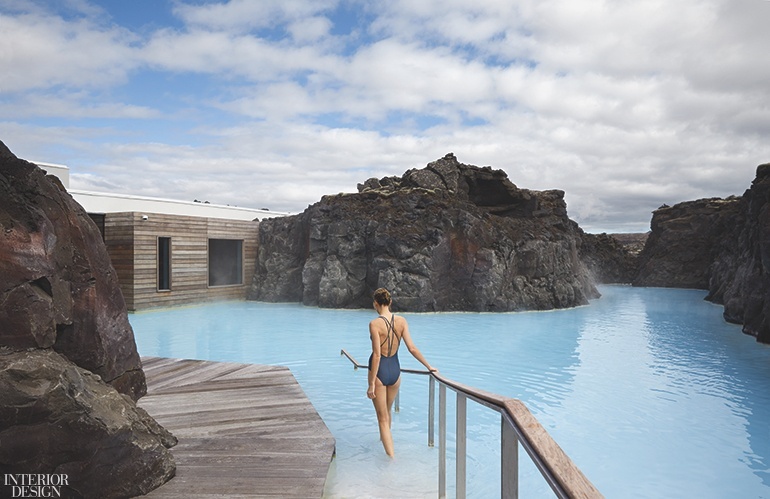 Because geothermal water is also celebrated for its healing properties, a company calling itself Blue Lagoon launched a skin-care line incorporating the water’s rich minerals and algae. 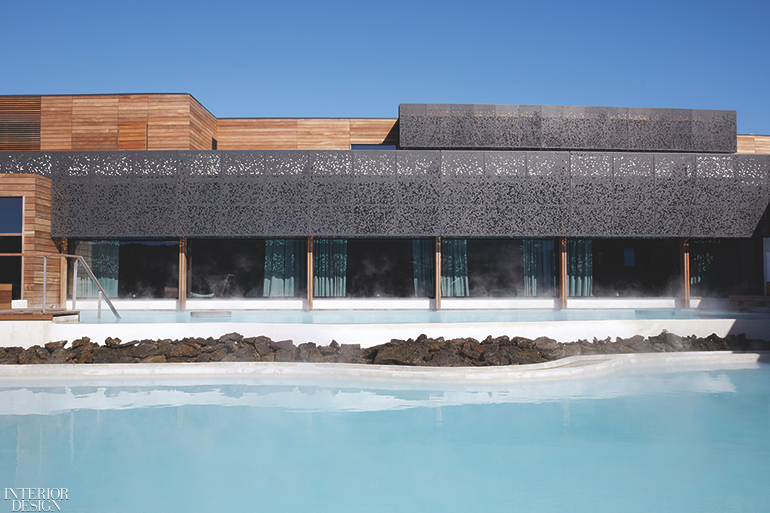 Building on that success, Blue Lagoon then hired Sigþórsdóttir to build a day spa. That was in 1994. 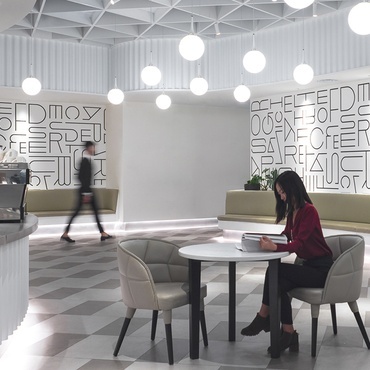 Her designs for a hotel, a restaurant, and a psoriasis clinic followed. 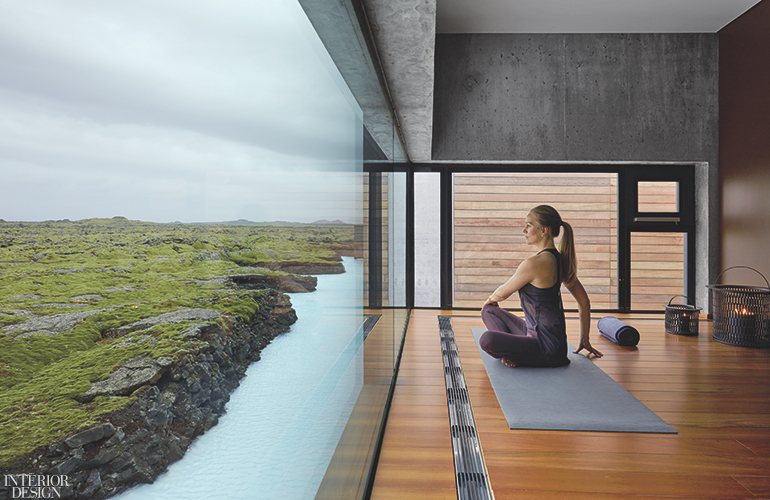 Visible from the hotel’s yoga room, the lava field resulted from a volcanic eruption in 1226 A.D. Photography courtesy of Blue Lagoon. In the latest expansion, they’ve been joined by the Retreat Hotel and the Retreat Spa. These interconnected structures are built with concrete—much of it cast off-site to ensure the greatest precision and to protect the fragile ecosystem—wrapped, moatlike, by the lagoon itself. “We knew the biggest draw is really the water,” Sigþórsdóttir says. It’s divided into independent pools, heated to temperatures ranging from 98 to 104 degrees Fahrenheit. 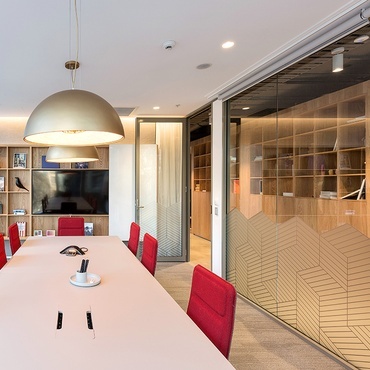 Partitions in Brazilian cherry define a niche. Photography courtesy of Blue Lagoon. Rust-prone steel was avoided entirely. High-quality aluminum proved the better choice. Much of the wood throughout is Brazilian cherry, a particularly hardy hardwood. 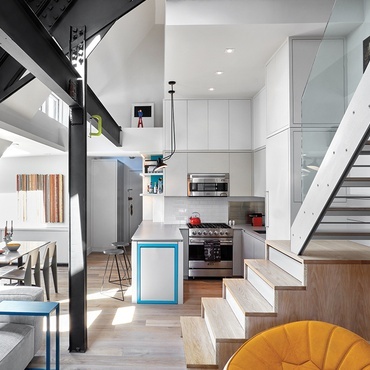 The client’s willingness to halt the drilling through the lava stone when the designers discovered something interesting paid off in what Sigþórsdóttir describes as “beautiful little nuances and surprises.” Some are part of the structural walls. Others were carved into furniture for the public areas. In the hotel lobby lounge, Icelandic ceramics from the 1960’s and ’70’s accompany chairs by Antonio Citterio. Photography courtesy of Blue Lagoon. In the lobby, this dominant material appears in the form of a carved surround for a woodburning fireplace. The wall behind is a soft gray concrete, carefully cast to leave no pin holes. 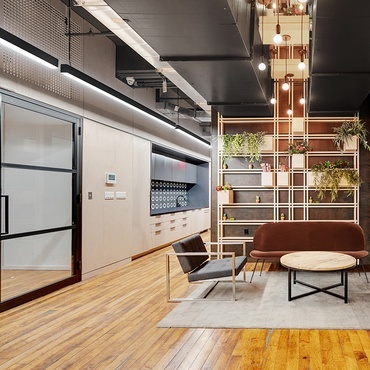 In the concrete wall behind the reception desk, a window frames the billows of geothermal steam rising outside for “a wow effect,” Sigþórsdóttir says. A wall of glass gives the lobby a panorama of the lagoon and moss-covered lava field, recently awarded UNESCO Global Geopark status. 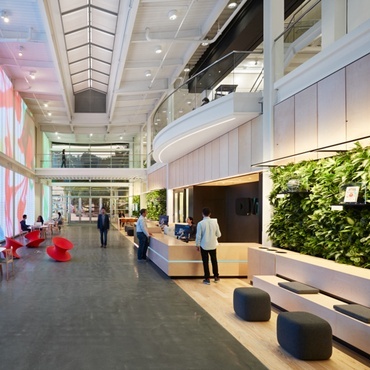 To temper the sun streaming in, an exterior screen runs across the top of the glass wall. The screen is perforated in a water-jet cut pattern based on the air pockets in lava stone. “We have a parametric modeling wizard at the firm,” she notes. Lava stone, digitally scanned, supplied the pattern for the water-jet cut aluminum screen outside the lobby. Photography courtesy of Blue Lagoon. 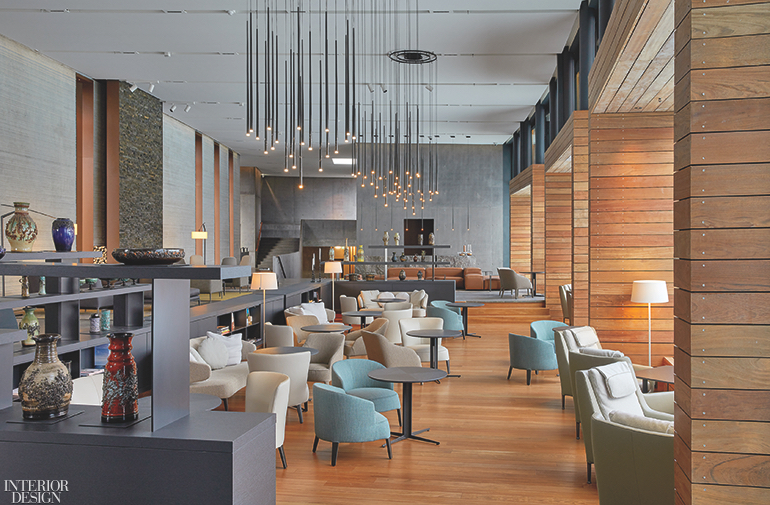 Taking advantage of the light and view, the lobby lounge is used for breakfast as well as check-in. Armchairs, upholstered in wool and leather, are by Antonio Citterio. They’re accompanied by a rotating assortment of Icelandic ceramics from the country’s Museum of Design and Applied Art. Blue Lagoon gave the museum a grant to purchase the pieces, dating from the 1930’s to the present, and now has the right to exhibit them. A color palette strictly limited to earthy grays or browns, moss greens, and the aquamarine of the lagoon extends from the lobby, into the two guest wings. Rooms and suites, 62 in total, range from 430 to 650 square feet, plus balconies or terraces—the suites come with private lagoon access, and the largest has butler service and an optional chef. Most accommodations boast freestanding bathtubs. 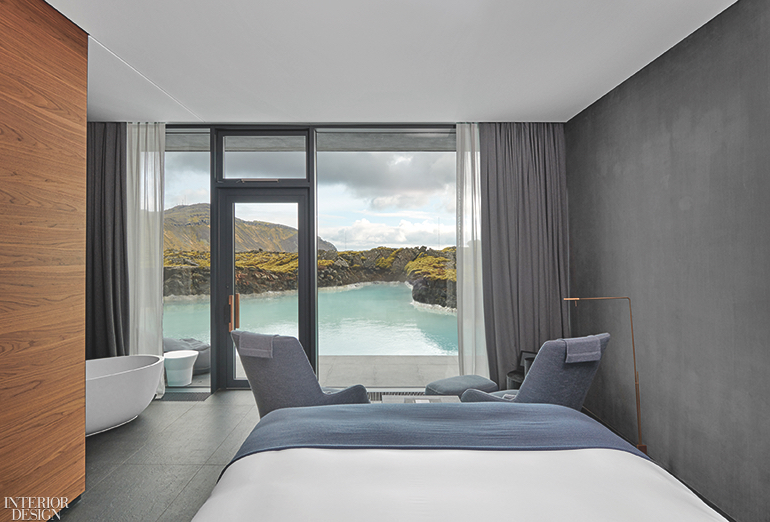 “One third of each room is dedicated to the bath, emphasizing that this is a spa hotel,” Sigþórsdóttir says. A bathtub in quartz composite stands in the corner of a guest room. Photography courtesy of Blue Lagoon. In the spa proper, a subterranean realm of 44,000 square feet, excavations into the lava stone form a series of interconnected chambers and treatment areas dedicated to silica (for scrubbing), algae (moisturizing and anti-aging), and minerals (purifying). A block of lava stone serves as a counter for juice and energy shots. The block is so heavy that it had to be craned in before the roof was built. To keep the focus on what Thorsteinsson sums up as “materiality,” the hotel’s Moss Restaurant is a tablecloth-free zone. Walnut tabletops are matte-lacquered for durability. The Museum of Design and Applied Art also collaborated on reeditions of mid-century seating. Barstools, for example, were originally designed for Reykjavík’s city hall. In the wine cellar, the hotel’s deepest zone, Sigþórsdóttir and Thorsteinsson preserved one of the most arresting features unearthed during drilling. At the base of the lava stone walls, gray gives way to a layer of blood-red pumice stone. Wine in hand, guests can peer into what seems to be the very heart of the earth. 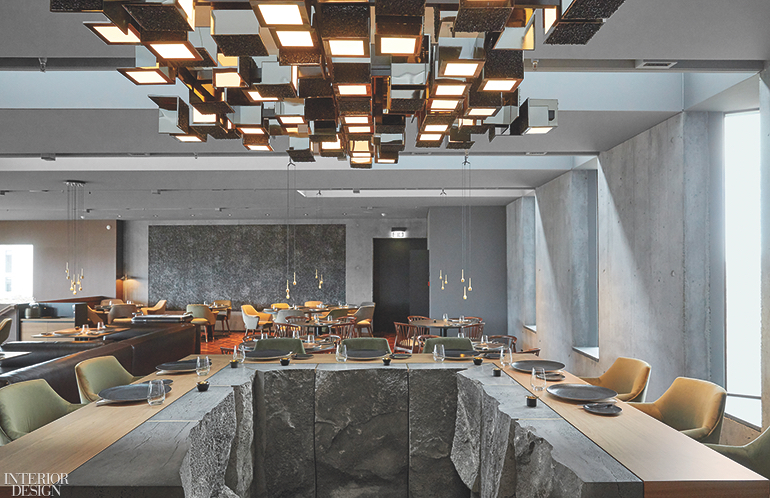 Lava stone and lacquered walnut meet at the chef’s table at Moss Restaurant. Photography courtesy of Blue Lagoon. Project Team: Anna Björg Sigurðardóttir; Ástríður Birna Árnadóttir; Davíð Hildiberg Aðalsteinsson; Einar Hlér Einarsson; Elín Þórisdóttir; Guðjón Kjartansson; Harpa Heimisdóttir; Hrólfur Karl Cela; Jóhann Harðarson; Jón Guðmundsson; Marcos Zotes; Niklas Dahlström; Perla Dís Kristinsdóttir; Stefanía Helga Pálmarsdóttir; Unnsteinn Jónsson: Basalt Architects. 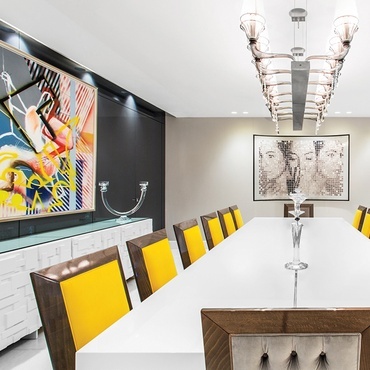 Carol Tayar; Carlo Casagrande; Daria Svirid; Igor Micevic; Stefania Perenich; Simona Sagripanti; Carlo D’alesio; Piero Santoro; Stefania Berselli; Mathilde Leroy; Daniela Duran; Francesca Miraglia: Design Group Italia. Liska: Lighting Consultant. EFLA: Structural Engineer, Civil Engineer, MEP. Jáverk: General Contractor.